Two fatal four-way matches and a face-to-face segment have been announced for next week's go-home edition of Raw. The four-ways will feature all of Raw's participants in the Money in the Bank ladder matches. Braun Strowman, Finn Balor, Kevin Owens, and Bobby Roode will face off in one of them, with Sasha Banks, Ember Moon, Alexa Bliss, and Natalya set for the other. For the women's match, WWE is questioning whether Bliss and Natalya will be able to compete after suffering storyline leg injuries. Bliss bailed on a six-woman tag tonight, leaving Banks & Moon on their own against The Riott Squad until Bayley tried to sub in for her. Natalya's storyline knee injury happened right before Nia Jax hit a Samoan drop to defeat her. 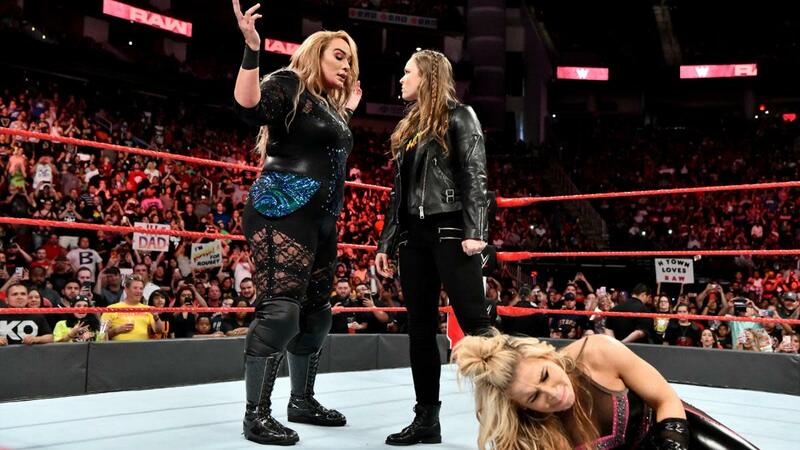 Both Jax and Ronda Rousey checked on Natalya following the match, then argued as they tried to console her in the back. Jax insisted that she's Natalya's friend just as much as Rousey is. Jax and Rousey will be involved in next week's face-to-face segment as part of the final build for Rousey challenging for Jax's Raw Women's Championship at Money in the Bank. Strowman defeated Roode tonight, and Balor beat Owens by disqualification when Owens wouldn't stop stomping on him in the corner. Owens got a ladder out after the match and hesitated when going for a frog splash off it. Balor closed the show by hitting Owens with a Coup de Grace from the ladder.